As 2014 begins, we hope you had a very enjoyable holiday season filled with celebrations with family and friends. If your holidays were anything like ours, they were full of fun, family, friends and lots and lots of wonderful holiday treats! Now, though, we all have to think about how to have a healthy AND happy 2014. If your child was averaging about two candy canes, one piece of fudge, and a couple cookies a day, he must be in dire need of a healthy routine reboot. December, aka the month of sugar-stricken kids running around the house like crazy people, has come to an end. It's now time to whip your family back into shape, or at least re-introduce some healthy habits after all the sugar, junk, and irregular routines. Not sure where to start? See below! 1. Purge the fridge. Go on, get rid of it…all of it. Cookies, cakes, holiday leftovers, any stray bits of candy, etc. that should no longer be consumed—toss it. Even if it hasn't gone bad yet, throw it out anyway. It's a new year, start fresh. 2. Get back to the root of your day: a balanced, healthy breakfast! Yogurts, oatmeal, fruits, eggs, or wheat toast with peanut butter are all good items to sample. Skip the juice and try a small glass of milk, almond milk, or a homemade smoothie (with ingredients you trust) instead. Breakfast is a great time to connect with one another. If your children are still on break, take advantage of the last few morning meals without having to rush to get to school! 3. Avoid fast food, soda, sweets, and big rich meals. Even if these foods are in your family's regular diet, take a break from them. Especially now, while everyone resets for a healthy year. 4. Take an excursion. Go on an active family outing: skiing, sledding, ice skating, ice fishing, or bowling. Anything will do, just get off the couch and away from any screens! 5. 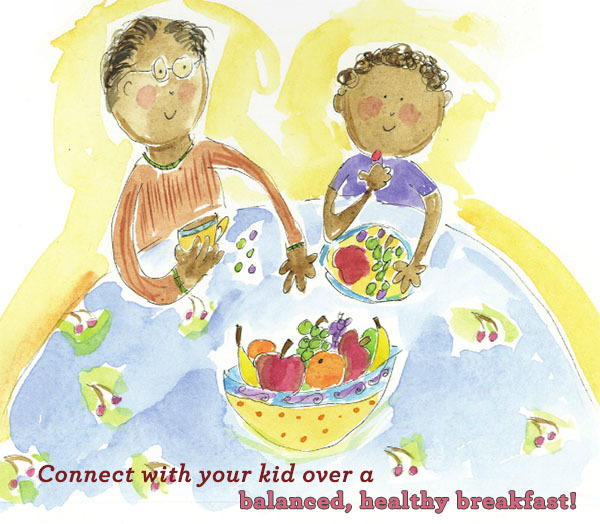 Invite fruits and veggies to all meals. Set a good example for your children by eating these foods in front of your children and serving them with breakfast, lunch, and, dinner. If you're feeling creative, try a fruit skewer or some sort of fun shape to entice your little ones. 6. Make meals a team effort. Train your children to be your little sous chefs. Let them choose from a selection of healthy recipes, make a shopping list together and take them along to the grocery store. Children are more likely to eat the foods that they help make in the kitchen. 7. Look for healthier substitutes for your family's favorite recipes. Chances are, your children won't even notice the swap. Or, for super picky eaters, find ways to disguise veggies. For example, try making a pasta sauce by using a blender to mix lots of veggies together into a purée—they'll never know! 8. Create a fortress against illness. Make sure you regularly go over hand hygiene with your little ones. Check up on them to ensure that they're washing and scrubbing their fully-soaped hands for at least 20 seconds before rinsing with water. Cold and flu season is still upon us, and can often times be in full force come February. Also, don't forget to help them bundle up with the appropriate clothing if it's cold outside. 9. Re-establish a normal sleep schedule. Holiday festivities often disrupt your children's sleeping patterns. The anticipation of Santa's arrival and staying up until midnight to celebrate New Year's Eve are enough alone to throw off a routine. Getting enough sleep is fundamental for you and your children. Let's welcome 2014 with a healthy and happy family! Do you have any healthy recipes or ideas for activities to start the New Year fresh? We'd love to hear your thoughts. Get ready to snuggle up under the covers because today is National Sleep Day! To celebrate this day of rest, receive 33% off The Night Night Book by Marianne Richmond. Save all weekend on this perfect bedtime book and make sure to celebrate with an afternoon nap or an extra hour of shuteye. Offer expires 1/05/14 at 11:59 PM CST.